Two Heritage Rivers. Two First Nations. 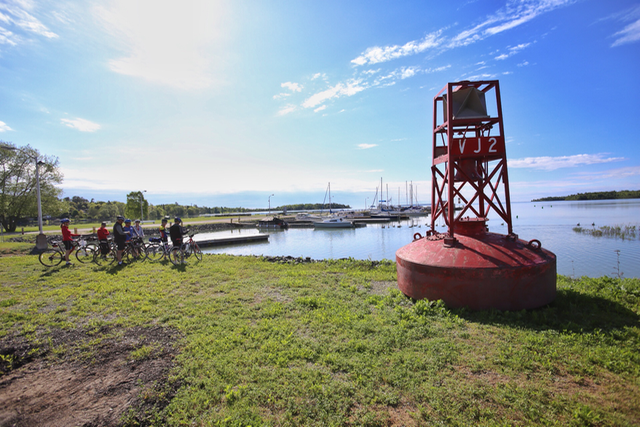 On today’s Great Waterfront Trail Adventure you’ll find long stretches of gentle rollers, have the opportunity to travel along the shores of two heritage rivers (the Thessalon and the Mississagi) and pass through two First Nations (Thessalon and Mississauga). You’ll see idyllic farmland, revivified by the infusion of Mennonite families from Southern Ontario and a string of communities, each with nearly two centuries of history. Tip: Today’s trip includes the longest consecutive stretches of both gravel riding and travel along the shoulders of Highway 17. For those new to gravel riding, try not to place as much of your weight on your handlebars. Your control should improve and your hands will thank you. 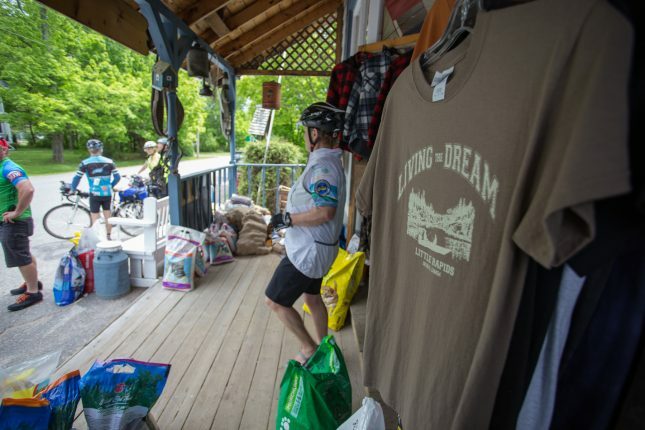 The Great Lakes Waterfront Trail between Iron Bridge and Blind River [Maps 6 & 7] follows 23km of generous paved shoulders on Highway 17 and skirts the shores of the beautiful Mississagi River. There will be truck traffic. 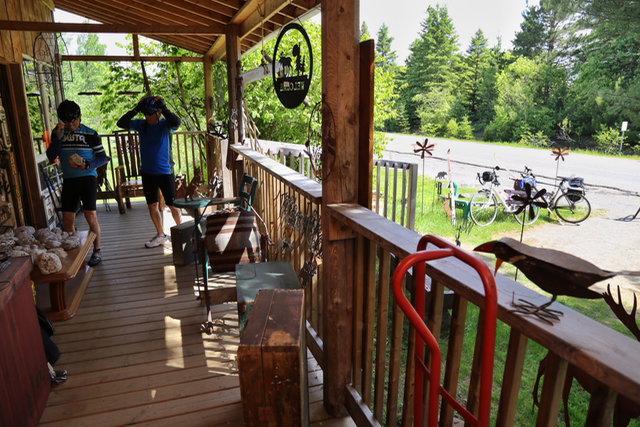 We recommend that those not comfortable riding along the highway choose the optional shuttle from Iron Bridge to base camp at the Blind River Marine Park and still enjoy a quick view of the river. A great place to grab a few items and fuel up. Tip: If you like cheese, they stock over 30 flavours. If you like sausage, theirs is considered one of the best around. If you’re a messy eater, buy one of their t-shirts so you don’t get a thing on your jersey. Hang a right at the intersection of Little Rapids Road and Highway 129 for a trip to Thessalon, where you’ll cruise along the banks of the Thessalon River, past the scenic red bridge into the heart of this nearly two-century old community with roots in the lumber industry. 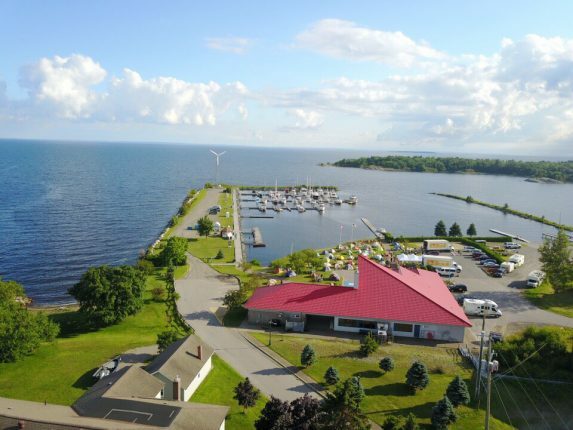 You’ll be able to stop for a dip at the beach, grab a snack from a pick of local eateries, or relax by the marina and take in views of Lake Huron. Tip: Make sure to stop by Jo-Anna’s Bakery and Cafe at 212 Main St for some of the best butter tarts around, and then eat them on the beach where no one will notice your crumbs. The side trip into Thessalon is 5km each way so make sure to plan for a little extra time and to consider the extra distance travelled when referring to event mapping. Nestled in the corner of Ingram and Brownlee Road you’ll find the entrance to this resort and campground with serene views of Brownlee Lake, a beach and a small restaurant. Tip: If you have your heart set on stopping in at Dorothy’s restaurant, make sure to call ahead: 1-705-842-2118. 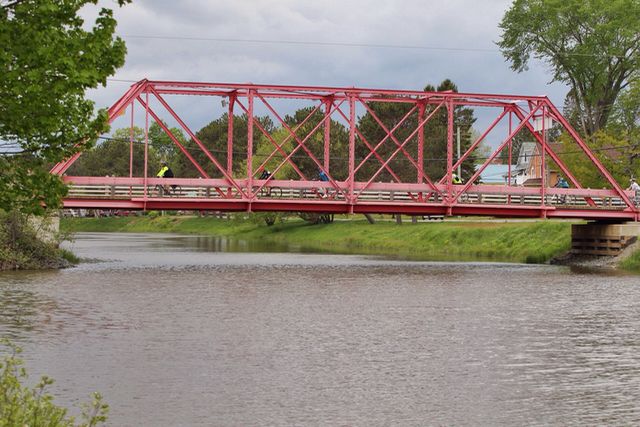 Originally named “Tally-Ho,” this town, with its history steeped in farming and lumber, was renamed in 1886 to honour of the iron bridge that spans these quiet shores of the Mississagi River, the first iron bridge constructed in Ontario. 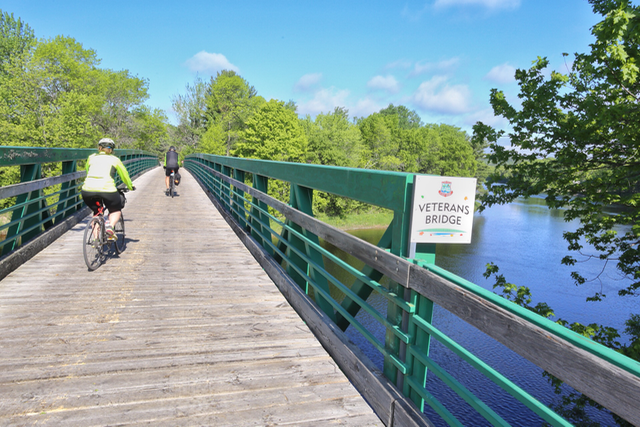 That bridge was eventually replaced after almost a century of use, but its spirit lives on in the Veterans Bridge that connects to nearby Tally-Ho park, and which you will cross on today’s journey. During your visit to Iron Bridge, you’ll find 3 restaurants, convenience store and the Iron Bridge Historical museum. Between Iron Bridge and our overnight location in Blind River are 23kms on the generous paved shoulders of Highway 17. We welcome those not comfortable riding along the shoulders of the Highway to take the shuttle bus from Blind River to the GWTA base camp at the Blind River Marine Park. Shuttle departs for camp at 2pm. MTO has created this parkette and picnic area with washroom facilities and a stellar view of both the Mississagi and nearby Woman Island. 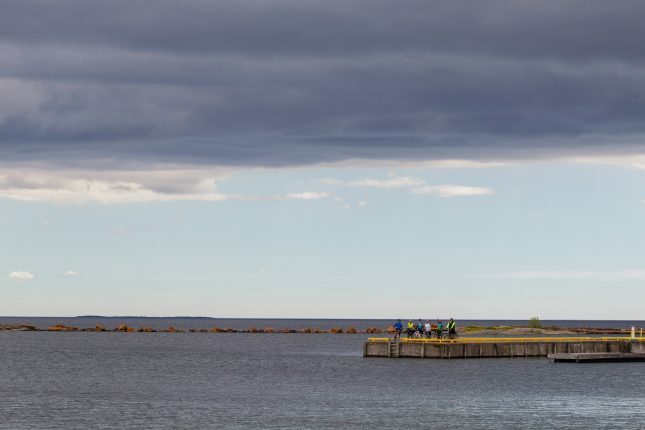 Those wishing for a break from their travels along Highway 17 may choose to take alternate off-road route connecting Mississauga First Nation and Blind River. This scenic trail meanders through forest, marsh lands and scramble-worthy rocky balds, a collective effort between Mississauga First Nation, and the Town of Blind River with funding from the Great Trail. 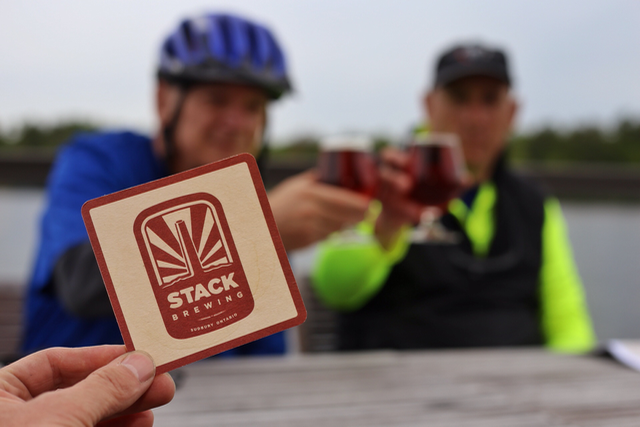 Looking to stop for an early meal on your way into town or a celebratory pint to commemorate a day well-traveled? Pier Seventeen has a lovely lakeside patio and serves some local brews including Stack (remember that name, it will come up later). Blind River’s history is cradled in the fur trade and logging and mining industries. The Town has several restaurants and amenities, and some great river and lake views. Tip: The eateries stay open later. If you’re looking for laundry service or LCBO, groceries or convenience, you may want to get those out of the way before grabbing dinner. Things to Do: Looking for a swim? Try Fourth Sand Beach. Looking for a hike or some trail riding (including lookouts and secluded beaches) stop by the Boom Camp Trails. Interested in local history? Visit the Timber Village Museum. You love it. You hate it. You love to hate it. You hate to love it. However you feel, whatever your story, if you’re from Southern Ontario you will have some sort of relationship with Tim Hortons. You’ve gone without it for one day, but now…it’s…BACK! Tonight campers will be nestled right up to Lake Huron as we stay at the Blind River Marine Park. 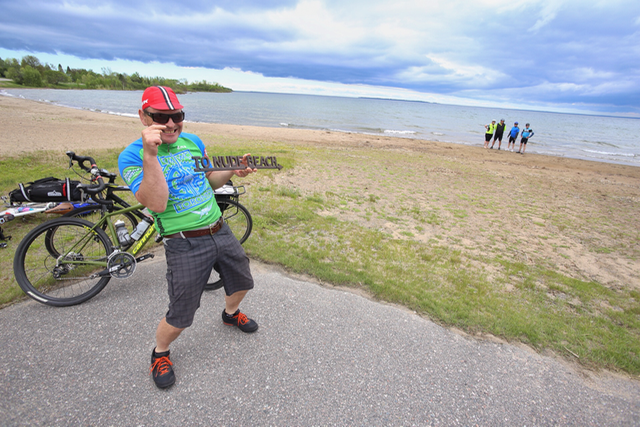 During today’s journey you pass through the Municipality of Huron Shores, the first Great Lakes Waterfront Trail community to sign their route exclusively via a municipally led and volunteer driven work bee, giving a window into the heart of this stellar community and making the Trail uniquely their own. This stretch of trail on the shoulders of Highway 17 represent a historic partnership with the Ministry of Transportation, which shouldered over 50 km of Highway 17 in order to achieve connectivity between Sault Ste. Marie and Sudbury. 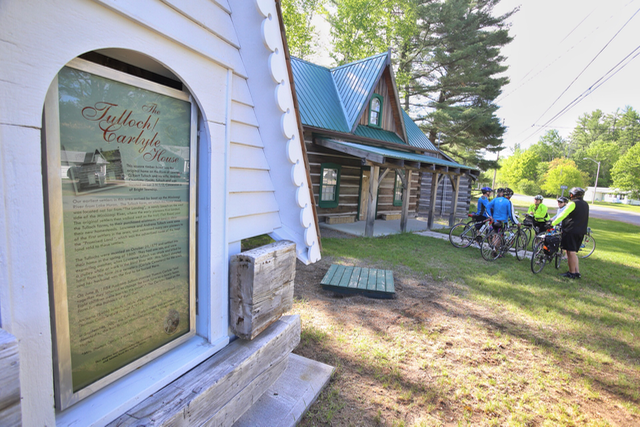 The shoulders on the highway and the signs installed along it are a reminder of this partnership and the efforts by the Province to achieve this, the first long-distance cycling route in Northern Ontario.